Using sunscreen isn’t the only sun protection step you should take, but people often rely on it too much. That’s a problem because our sunscreens may not be protecting us as well as we think. In part, we have ourselves to blame—we tend to use too little, don’t rub it in properly, or don’t reapply enough or at all. But even if you do everything right, the odds are good that your sunscreen may not deliver the sun protection factor—SPF—it promises on the label. This year we tested and rated more than 60 lotions, sprays, and sticks with SPF claims of 30 or higher—30 being the minimum level recommended by the American Academy of Dermatology. But 28 of them­—a full 43 percent—failed to meet the SPF claim on the label. Three of them fell far short, with our tests showing an SPF of less than 15. That’s not enough sun protection, and it could leave you vulnerable to sunburn and possible long-term skin damage, such as wrinkles or skin cancer. Those results aren’t a fluke; we’ve observed this pattern in our testing over the past four years. Of all the sunscreens we’ve tested over that stretch of time, fully half came in below the SPF number printed on the label, and a third registered below an SPF 30. We crunched the data from four years of our sunscreen testing—104 products in all—to see how well sunscreens in general protect you against the sun’s UVB rays. Our findings were troubling, especially when it came to mineral products, often called “natural” sunscreens—those that contain only titanium dioxide, zinc oxide, or both as active ingredients. The Food and Drug Administration (FDA) doesn’t routinely test sunscreens; it requires the manufacturers to test their products. But in most cases the companies don’t have to submit their results, just keep them on hand in case the FDA asks to see them. What’s more, companies only have to test a sunscreen on people when a product rolls out or is reformulated. Consumers have a right to receive the level of sun protection they expect. We’re submitting our four-year results to the FDA and asking that it review its sunscreen requirements and investigate further. Can You Trust the SPF? In four years of our sunscreen tests, almost half of the products failed to meet their SPF claim after water immersion—despite the fact that all featured claims of water resistance. And if you trust your skin to mineral products, you’re taking a greater chance; the mineral-only sunscreens performed far worse than the chemical formulations. 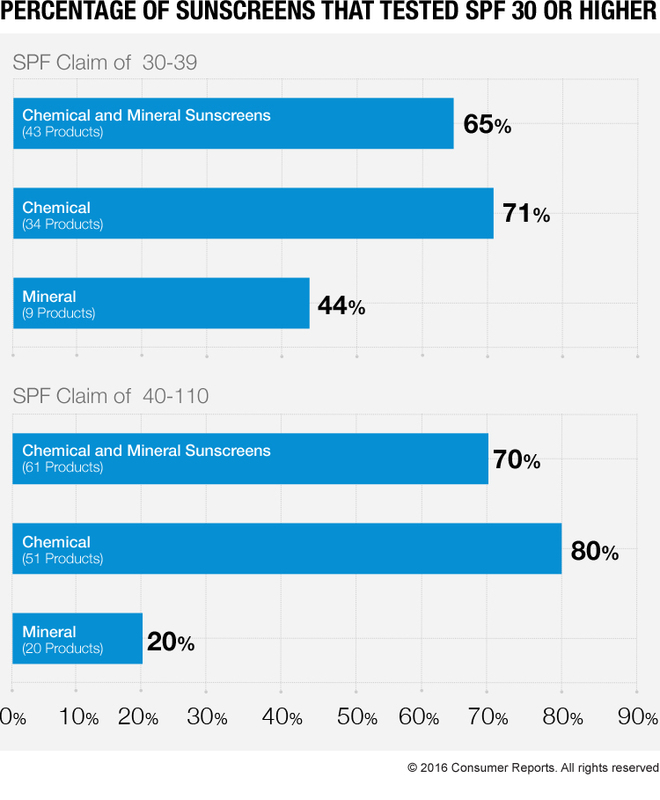 When we separated the sunscreens into categories based on the claimed SPF, we found that a significant percentage tested below the number on the label. That was true at every SPF level. So your best bet is to pick a recommended sunscreen from our Ratings. But if you can’t, choosing a chemical sunscreen with an SPF of 40 or higher will give you a better chance of getting at least an SPF 30, the minimum level many dermatologists recommend. Sun Protection From the Inside Out? If you down a bottle of an orange-peach drink 30 minutes before going outside, you’ll get 3 to 5 hours of sun protection—at least that’s the claim of UVO, which the company says is the “first ready to drink vitamin supplement specifically formulated to protect and repair your skin from sun damage.” The company also asserts that the drink’s 30-plus vitamins, antioxidants, and phytonutrients are “scien­tifically proven to work.” As with other supplements, UVO ($20 for four 12-ounce bottles) does not need prior approval from the Food and Drug Admin­istration to make those claims. Founder and CEO of UVO, dermatologist Bobby Awadalla, M.D., says the company’s preliminary testing, similar to what the FDA requires for sunscreens, found that drinking UVO protected against sunburn for at least 3 hours. He would not supply us with the study, however, saying that he wanted to publish the research, and could not if he released the results. Consumer Reports did not test UVO, so we can’t verify the company’s claims. Research suggests that some of the individual ingredients in the drink may offer UV protection, but we know of no independent study of UVO or its combination of ingredients. Even if the product does what it claims, protection would be modest at best: It can’t replace sunscreen. Awadalla said he agrees with that, but based on the company’s marketing, a consumer could easily assume otherwise. There is no mention of using sunscreen in conjunction with the drink on the bottle, and though the warning “should not be used as the only source of sun protection” is on the company’s website, it is not prominently displayed. Our advice: Skip UVO and other supplements like it. Consumer Reports has no relationship with any advertisers on this website. This article originally appeared in Consumer Reports.